Guilio Paolini came to international note as a leading member of the arte povera group in Italy in 1967. Like the others, he uses found materials and often introduces historical and literary references into his imagery. Works such as this have a poetic quality that is common with arte povera and yet there is a strong conceptual and critical streak that is not normally associated with the group. Many of his installations directly critique assumptions about art history and play with the rules of perspective to disclose their paradoxical illusionism. ‘L’altra figura’ (the other figure) is a deceptively simple play on the classical theme. The two heads raised on plinths to the height of a modestly sized viewer are identical plaster casts of a Roman copy of an earlier Hellenistic bust. The busts show the heads slightly at an angle to the body, their faces turned to reflect each other precisely. This slightly sideways glance lends a degree of animation to what would otherwise be a static mirroring. It is as if they have both just turned to catch the other's gaze; perhaps it is the dramatic incident that has just occurred between them. On the floor surrounding the two plinths is the manifest evidence of a minor disaster. 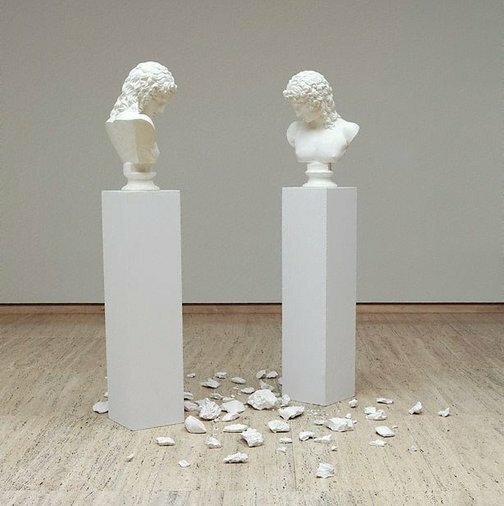 Another bust that seems to have crashed to the floor, shattering into multiple pieces of plaster, is just barely recognisable as the third of a kind. The twins may be thought of as a related pair or a mirroring of one but three is the beginning of an indefinite number, suggesting infinite reproducibility or endless cloning. A common theme of Paolini’s work investigates representational strategies in art since the Renaissance, including modernist aspirations to find the essence of things. Mirroring is the most immediate form of mimetic representation so it is reasonable to begin to see this as a work that follows this line. The Greco-Roman heads also incline us to suspect narratives from antiquity. Could the smashed figure lying on the ground, in a more-or-less circular arrangement, be the rippled effect of the reflection in a pool disturbed by Narcissus reaching out to caress his own loved image? This would certainly be a poetic take on the impossibility of possessing the desired object in representation. The degree of fragmentation of the third head also suggests a fall from a great height; could this be the mythical Icarus, who ignored his father’s warning not to fly too close to the sun? This pragmatic warning masks a greater peril since the sun is Apollo riding across the sky in his chariot. Apollo for Plato was the ultimate source of pure form, something representation could never capture, although neo-Platonists and modernists dreamt of doing so. Poor Icarus got carried away and soared towards this great source but was struck down by the jealous god for his presumption. Anthony Bond and Victoria Lynn, AGNSW Collections , 'Contemporary Practice - Here, There, Everywhere ...', pg. 229-285, Sydney, 1994, 260 (colour illus.). Anthony Bond, Contemporary: Art Gallery of New South Wales Contemporary Collection , 'Objects and associations', pg.332-381, Sydney, 2006, 362, 363 (colour illus. ), 430. Anthony Bond, Art Gallery of New South Wales handbook , 'Contemporary', pg. 94-108, Sydney, 1988, 100 (illus.). Anne Loxley, The Sydney Morning Herald , 'Arte Povera - Art from Italy 1967-2002', Sydney, 25 Sep 2002, (colour illus.). Peter Timms, Art Monthly Australia , 'The hall of mirrors', pg. 31-33, Canberra, Jun 2002, 32 (illus. ).